Always enticing in divine twenties fashion, Phryne, one of the most exciting and likeable heroines in crime writing today, leads us through a tightly plotted maze of thrilling adventure set in 1920s Australia. Seven Australian soldiers, carousing in Paris in 1918, unknowingly witness a murder and their presence has devastating consequences. Ten years later, two are dead . under very suspicious circumstances. Phryne's wharfie mates, Bert and Cec, appeal to her for help. They were part of this group of soldiers in 1918 and they fear for their lives and for those of the other three men. 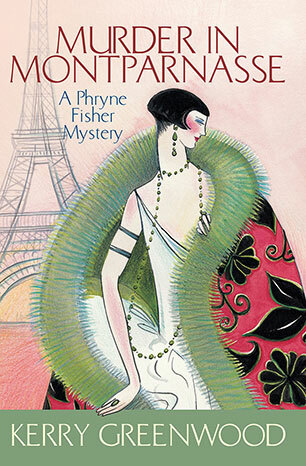 It's only as Phryne delves into the investigation that she, too, remembers being in Montparnasse on that very same day. Kerry Greenwood has written eleven novels in the Phryne Fisher series, the most recent being Away with the Fairies (2001). She is also the author of The Childstone Cycle, Cassandra and (with Jenny Pausacker) Recipes for Crime. The Things She Loves, a collection of essays about women who kill, edited by Kerry, was published by Allen + Unwin in 1996.